This is a condition in which the junction between the stomach and esophagus (i.e. food pipe) becomes too tight (opposite to that in GERD), not allowing food to pass down from the esophagus to the stomach. Due to this, the patient develops chest pain while swallowing food. 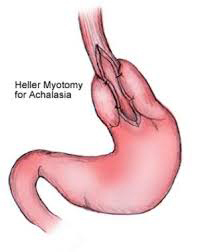 Achalasia cardia is best treated surgically for a long lasting result. The surgery involves splitting of the muscles at the junction of the esophagus and stomach, in order to loosen the junction. An anti reflux procedure maybe added in order to prevent GERD. The surgery can be performed laparoscopically or robotically, making 4 small cuts on the abdomen. Robotics is especially better than laparoscopy for long term relief.